Jessica Kafer ’10, a biology major with minors in chemistry and anthropology, combined her loves of biology research and community service when she studied abroad in Kenya through the School for Field Studies (SFS). Kafer originally planned to study abroad at the University of Cape Town in South Africa, until she learned about the SFS program in Kenya through Karen Jenkins, director of TCNJ’s Office of International and Off-Campus Programs. “I realized (SFS) was a better fit for what I personally wanted to accomplish during my semester abroad,” Kafer said. Kafer spent four months in an area of Kenya near Mount Kilimanjaro, the first three months through SFS. She used the final month to volunteer with a nutritionist at a hospital and travel along the coast of the Indian Ocean. 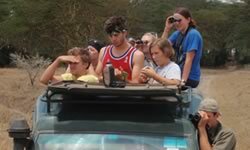 Through the SFS program, Kafer took three courses that focused on Kenya’s wildlife management, wildlife ecology and environmental policy. She also took a two-credit course on Kiswahili, the national language of Kenya, and Kenya’s ethnic groups. In addition to frequent field lectures and several trips to national parks, the students and professors went on two five-day expeditions to learn about conservation and wildlife management issues in other areas of the country. The final month of the program allowed students to chose a directed research group, where Kafer studied the status, trends, and impacts of rangeland conditions on the region’s wildlife. Some of Kafer’s favorite memories included gathering under acacia trees to cook with mamas during a break from installing rainwater gutters at a church, seeing an elephant and a monkey in the wild for the first time, playing soccer with HIV/AIDS orphans, and seeing the breathtaking view of Mount Kilimanjaro every morning.